If you can't go to the beach, bring the beach to you. Well, at least you build a home that is so Zen tranquil that you might as well be lounging with a Piña Colada or two at the beach. The stunner of a home that's in the spotlight today is a dream house if we ever saw one. It's far from an ostentatious bungalow with all the trappings of luxury. This one in fact looks like a cool beachfront property—at least from the outside. Designed by Ami Environment Design, the two-storey house (as you may have guessed) is eco-friendly from the tip to its foundation. 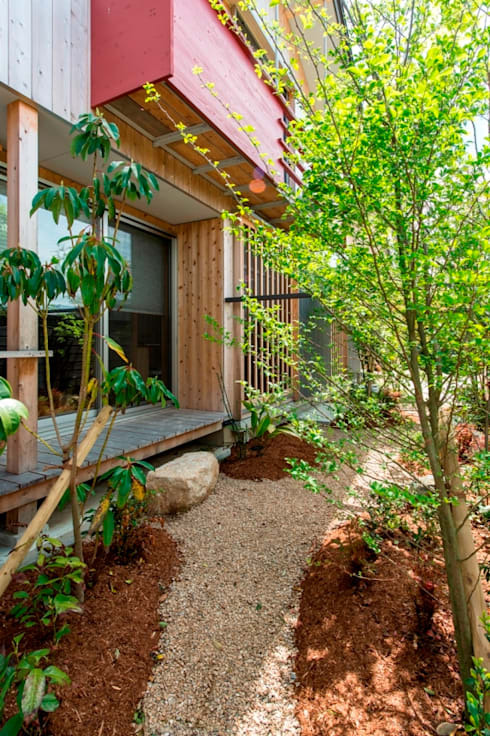 Using only natural materials, the architects have designed a house that is kinder to the environment, and in the long run, kinder to the owners wallets as well. And by mixing modern and traditional design elements, you have a house that is timeless in its appeal. Right at the outset, you see the eco-friendly touch that immediately comes across as warm and inviting. Where warm and fuzzy feelings are involved with architecture, there's a high chance of wood being in the picture. And so it is—the facade utilises wood as the main material, with an asphalt gable roof and a brick chimney thrown in for good measure. All the elements come together to create a classic yet relaxed feel. 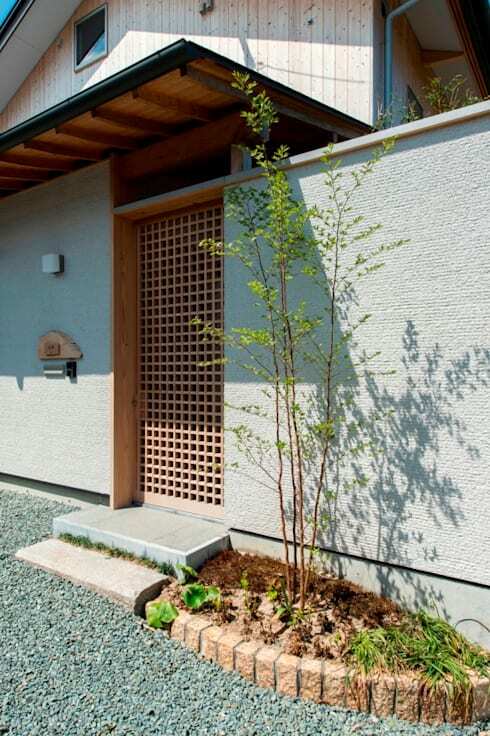 The front portion of the house is shielded by a fence that perfectly complements the roof. By not fencing the entire house, the impression created is one of airy spaciousness. Not to forget—Mother Nature is put to good use by planting greens that create a natural shield from passers-by. Pathway to Zen? We would say so. Already you get the feel for the things to come. The courtyard here is one of the most traditional aspects of the house where you feel as if you're miles and miles away from the bustle of the city. To create the atmosphere and feel of a Zen garden, a gravel pathway flanked on both sides by the loveliest plants has been put into place. Not to mention the strategically-placed boulders. Thanks to the fence that is to one side, complete privacy is maintained. If you need help to design your dream garden, help is at hand. The interiors of the house have been kept sparse, not in a monastery-style but rather by carefully using only the most basic furniture to create an elegant, refined look. Once again, wood is the focal material here, making a seamless transition from the outside to the inside. White ceilings and rice paper blinds further add to the feeling of calm. The fireplace and the pile of logs stacked alongside creates a wonderful feeling of warmth. A lot has been accommodated into this limited space, but since it's only the necessities, clutter is out of the question. An open-air jacuzzi and bathroom? Where do we sign up? Actually, this is the best kind of open-air—one that isn't going to make you wonder if there are peeping toms having a look-see. The area is completely blocked from outside eyes thanks to the fence, but it allows ample sunlight and views of azure blue skies while you're having the time of your lives. 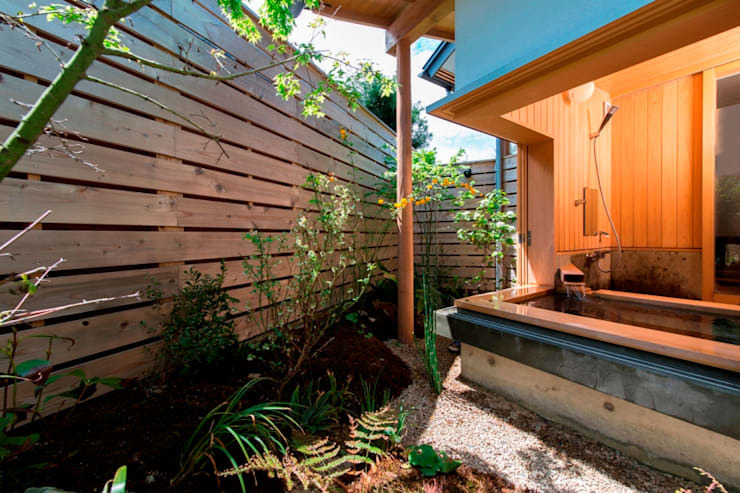 The bathroom has been designed to give it the feel of an Onzen (Japanese hot springs or the bathing facilities around it). Hour-long showers (or baths in this case) are bound to be an everyday affair here. If we have whet your appetite with this blissful bath, check out more here. Once upon a time, traditional lattice patterns were used in Korean architecture as the final touch to upper-class dwellings—and solely to enhance its beauty. Here, the architects have built in a lattice door with wooden eaves and rafters that is juxtaposed rather harmoniously with a textured wall that is grey in colour and modern in its appeal. The end result then is of a porch that cleverly brings together elements of the old and new to create a classic yet warm feel. 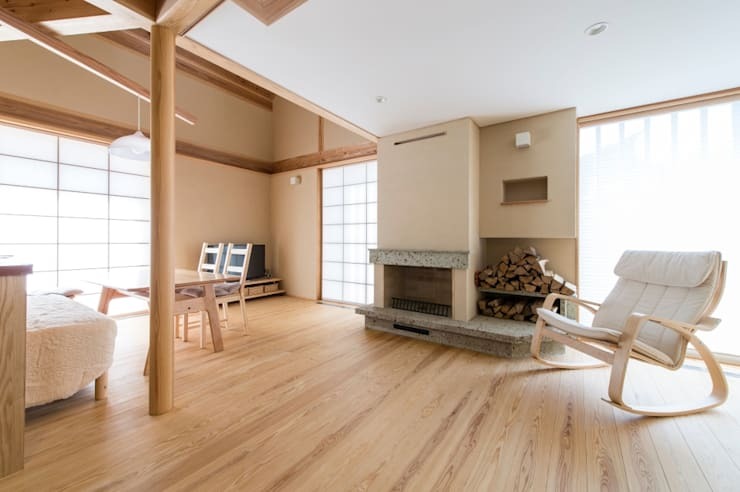 If you're looking to be inspired by more modern yet classic Asian-inspired homes, don't forget to check out An Asian home with a classic touch. 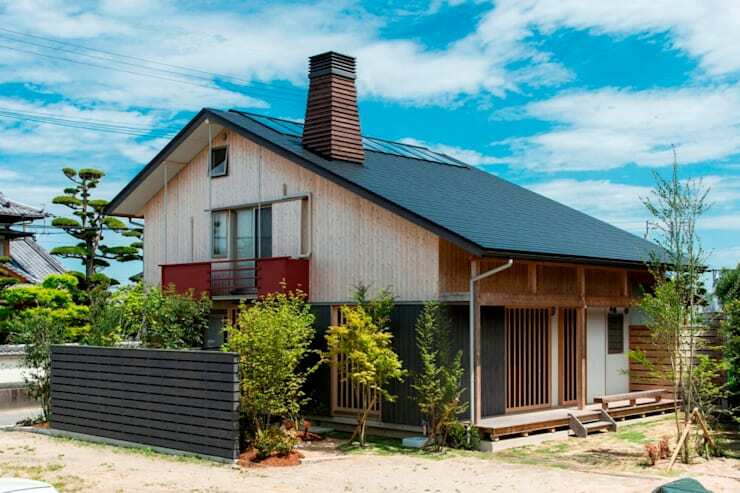 What did you think of this Asian-inspired, eco-friendly home? Tell us about it in the comments!